The 29.97 metre motor yacht Lady D, listed for sale by David Wiest at RJC Yachts, has been sold with David Johnson at Denison Yacht Sales introducing the buyer. Built in aluminium by Brazilian yard MCP to a design by Manoel Chaves, Lady D was delivered in 2008 as a Europa Explorer 100 model. An interior finished in Brazilian walnut joinery accommodates 10 guests in five cabins consisting of a main-deck master suite, two doubles with queen sized beds and two twins with Pullman berths, all equipped with entertainment centres, flatscreen televisions and en-suite bathroom facilities. In addition, there are quarters for five crew. The expansive main saloon has large light tan settees to port and starboard, coffee tables, an entertainment centre including a 55-inch LG HD television and a Bose stereo surround sound system, an L-shaped bar with three high back stools and a circular dining table with seating for six guests. The sky lounge is devoted to pure relaxation, offering an L-shaped settee to starboard, a games table and an entertainment centre featuring a 60-inch Sony Bravia television. Aft of the sky lounge, al fresco entertainment and dining is available at built-in seating, a round teak table and four wicker chairs, with this area completed by a bar and a six-person Jacuzzi spa tub. Up on the flybridge is a full wet bar with freezer, semi-circular built-in upholstered seating and a custom hard top with a retractable awning. Twin 1,670hp Caterpillar C32 diesel engines power her to a top speed of 23 knots and she is fitted with Naiad zero speed stabilisers. 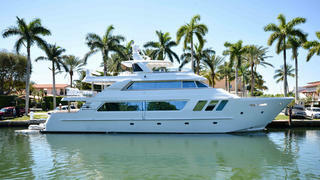 Lying in Fort Lauderdale, Florida, Lady D was asking $3,995,000.